Everyone remembers some special moments they shared with their grandparents. I was not fortunate enought to spend a lot of time with my maternal grandparents but was lucky to live with my paternal grandparents. My grandfather or bapuji as we called him, would love feeding us special dishes. No he never stepped into the kitchen to prepare anything, but simple ingredients were put together at the table while he would be waiting to be served with his main meal. I didn’t particularly like the hot milk and jalebi recipe of his so would run away from the table whenever he made that. What I loved were the yummy laddoos he made with rotli. I don’t know if Shruti and Shreena were lucky to have had those laddoos. 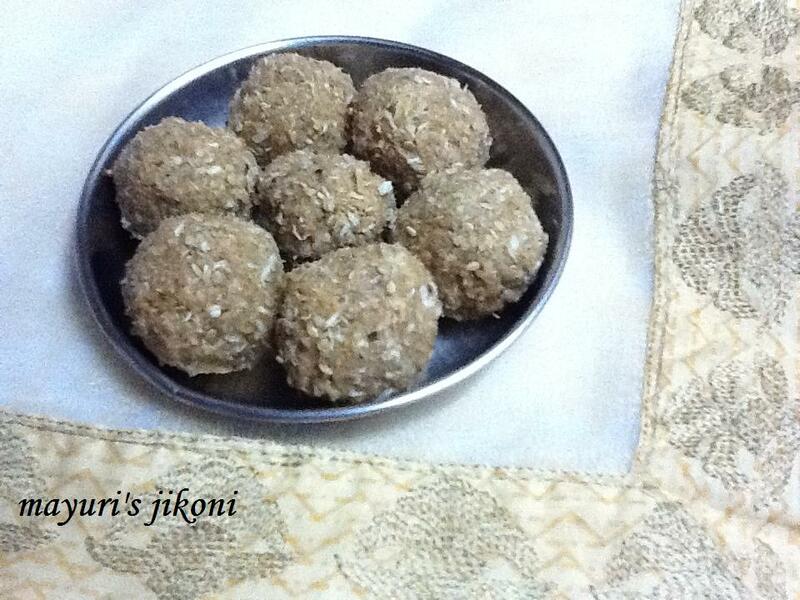 So a few days ago had just 3 leftover rotlis and decided to make the laddoos. I added dessicated coconut to the recipe. Bapuji would make us run to the kitchen to get melted ghee, gur, sesame seeds etc. And within no time laddoos would be ready. I took the easy way and ground the rotli pieces in a herb mill. Bapuji would make it into a powder form using his hands. Add the rest of the ingredients to the ground rotli and mix very well. Shape into tiny balls by rolling and gently pressing it using your fingers and palm. If the mixture is too dry to press into a ball, then add another tbsp of ghee. Stays in the fridge for a few days. Can add almond powder if you want. your version is yummy and flavorful Mayuri…and you have nice blog….